A while back I made a small Green Man mask I was pretty pleased with. It took me over a year to feel okay about parting with it before I could post it on my Etsy site, and it sold within 24 hours. A friend of mine bought it for her mom out on the East coast, who gets a number of remarks on it. I think that’s pretty cool and have been wanting to create more works people comment on. The magic hasn’t quite happened yet. A month after I sold my original Green Man I got an email from my friend. Her mom’s neighbor likes that mask so much I’ve been asked to make another one. Of COURSE I’m happy to make one! I just need to get on it already. My original estimate was a week. Add a major health issue and a new job, and now we’re at least three weeks overdue. I’m not happy with myself but have been spending what time I do have at home on this project. 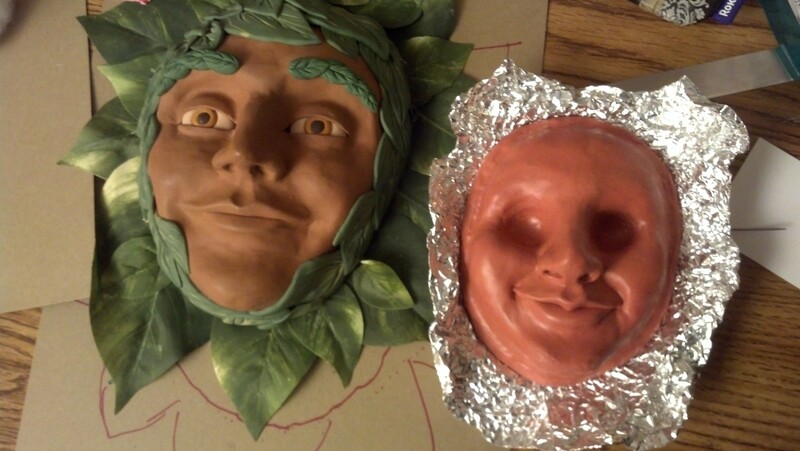 In the pic I posted here you clearly see two masks — one is the one I’m making for my friend’s mom’s neighbor, and the other is one I’ve been working on as an experiment. As you can see, they are in completely different stages of completion. On one of them I was on my way to the oven with it when I realized the eyes were too creepy so I scooped them out. It was an uncomfortable but necessary task that made me feel like a serial killer. The other one I didn’t like his eyebrows, but he was baked already, so I had to pry them off with a tile nipper. Does my art sound glamorous yet? Try not to think too hard about it. All good art goes through phases of clunky backtracking and do-overs. I sometimes think that’s why artists talk so much about their work — it’s not always the result that makes the art, it’s often the process. My process for these happened to involve eye-gouging and tile nippers. ToMAYto, toMAHto. I will get the little guy on the right new eyes this week. As for his larger friend on the left I think he’s going to be just fine. Posted in Craft and tagged masks, polymer clay. Bookmark the permalink. A couple of days ago I bit the bullet and applied for a table at my first official craft show, The Crafty Underdog in Portland, OR. Melody and I have been hoping to pool our efforts to do more craft shows, but weren’t really sure how to do that until now. I submitted my entry fee, answered all their questions… and now I wait to be approved. At least I think that’s how it works. Keep your fingers crossed for me that I win a space at this show, heaven knows we’ve been working all summer to make sure I have enough inventory for one. If it helps my chances, there’s a lot of other great stuff I have done that never got sold. I either gave them away or kept them for myself. For your consideration, and for The Crafty Underdog, here is a portfolio of my notable past works. Enjoy. This little fella was my first effort in a very long time. I have Christi Friesen to thank for the inspiration. I gave it to a friend as a gift for her bridal shower. I once worked for a Sikh man who had a young son. The Sikh do not have a holiday equivalent to Christmas, but his son was obsessed with Santa Claus! 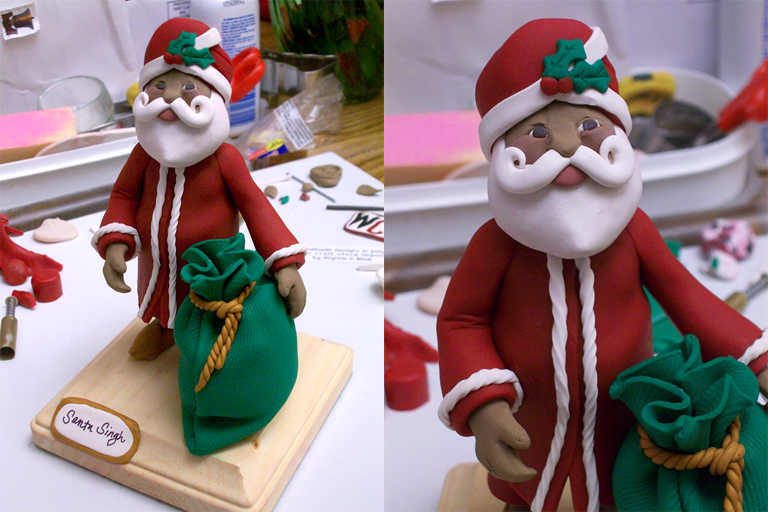 I made Santa Singh so he could have a more relatable jolly fat man to admire. Other than a turban that probably could have been a lot bigger, he was very well-received. I might even make more someday. Since the first one turned out so well I decided to try again. 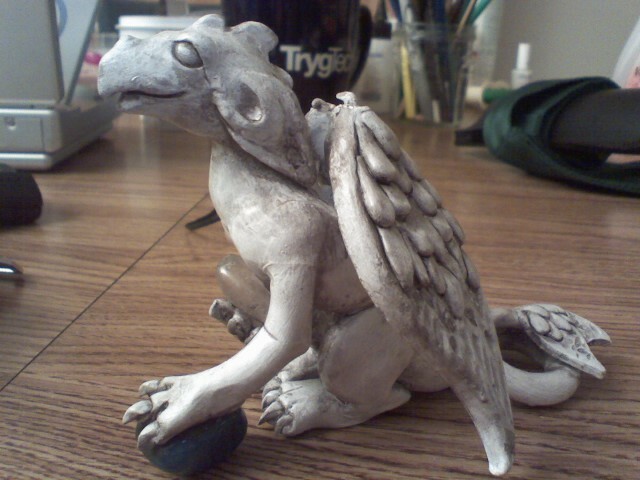 This time around I added limbs, scales, and accessories, and eventually mounted him on a wood base for display. 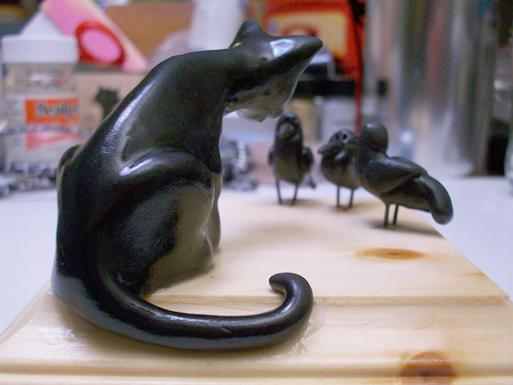 He currently resides with a dear friend in Atlanta, GA.
My late cat Grady loved to watch the birds outside our windows. He wasn't much of a hunter, despite his fascination. In this sculpture, I imagine what it might look like if he actually did come face-to-face with those birds. 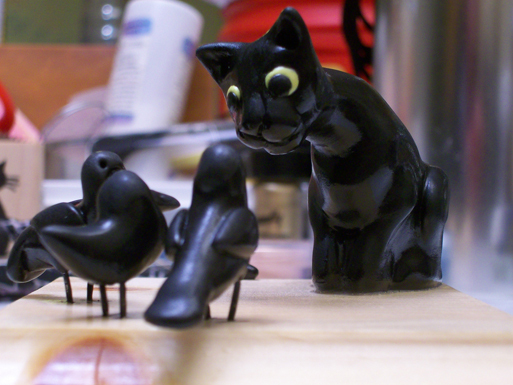 Grady and the Birds, from another angle. After his death in early 2011, I couldn't bear to part with this. It sits on my mantle next to my favorite picture of him. These offbeat ornaments have been best sellers in my Etsy shop for the last two years. 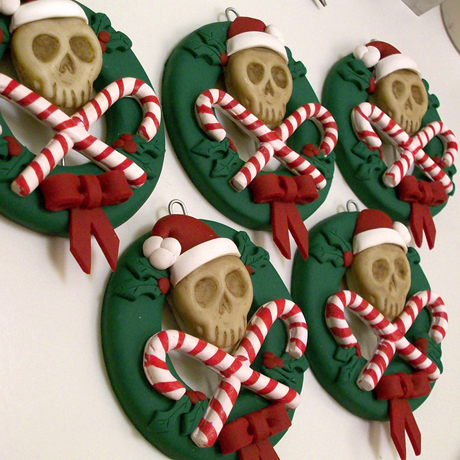 I made molds for the skulls and reinforced the candy canes with floral wire. The set pictured here were purchased by a woman in the UK for her first Christmas with her boyfriend. My first overseas sale! Posted in Craft and tagged polymer clay, wayback machine. Bookmark the permalink. The transition from budding entrepreneur to crafter-with-a-day-job has been a little rocky. I’ve been a little sad at the growing loss of my free time and adjusting to my new work environment. With home computer problems, I couldn’t even pretend to be crafty through the wonderful world of blogging. Still, I’ve been giving it my best effort. After running polymer through my pasta machine, I cut off the fraying edges, coated them with different colors of PearlEx powders, and then layered them. Pretty cool, eh? This effect was created using #651 Pearl White and #662 Antique Silver on black clay. I wanted to reproduce the raw and aged metal effect on a larger scale. After a really uninspired craft night this week I decided to take the weekend and FORCE myself to make something. My summer Scrabble tile project left me with a desire to return to my clay work, so I’m experimenting with making frames for them. I mean, Scrabble tile pendants are cute and all, but I can’t wear something so… light. 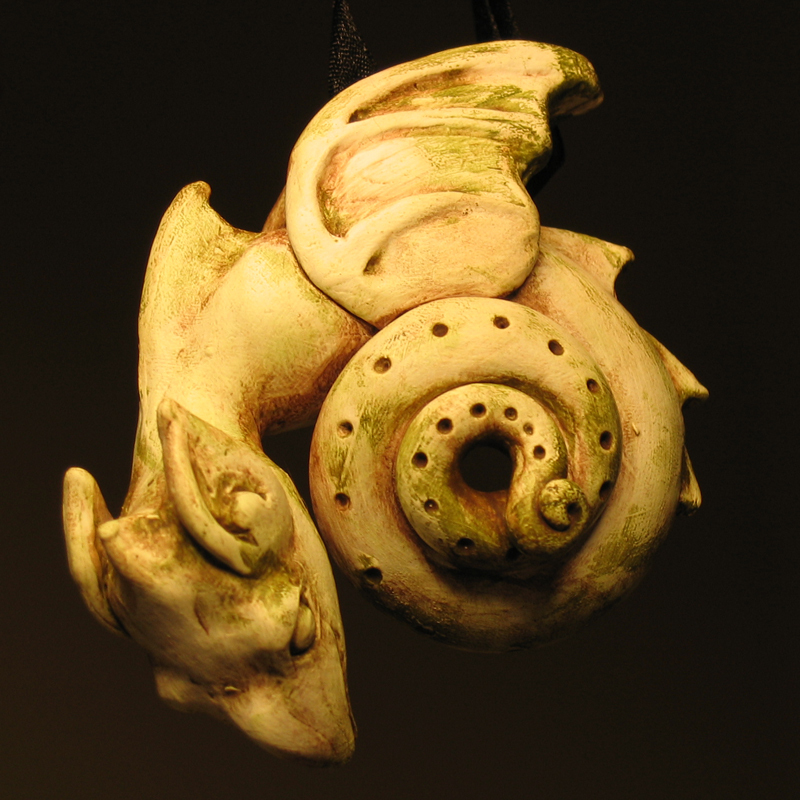 Adding a polymer clay frame would give my pendant the necessary weight for it to hang comfortably around my neck. For some reason I was trying to be artsy with the camera angle here. What it doesn't show is how running the piece through the pasta roller took the shine out of the metallic powder. I love the look of black clay gilded with PearlEx powders – there’s something very elegant and spooky about them – I did a stamped texture, a raised texture, and then this layered design that looked really cool the first time I tried it. The second time I tried the layers I think I may have overworked it a bit. Overworking the really cool layers flattened and dulled them. rather than waste the clay and the effort I attempted to salvage things with more PearlEx. While the results I got were exactly what I expected and looked nice, I still lost the part I thought was awesome in the first place. Liquid Polymer can be tinted with alcohol ink or oil paint (among other things). For my purposes, I wanted to be able to brighten the metallic areas of my tiles. A combination of liquid polymer, clay softener, and pearl powder should do the trick. Rather than write everything down twice I have elaborated on my steps in the image captions for this entry. I figure it’s like getting two posts in one — one fully of blabbity text, and another filled with semi-informative claygeek data. Helpful? Probably not. I’m doing my best here, people. Throw me a bone. These are now baked and ready for me to do something with them. I think I’m going to add a clay bail to the back instead of gluing a metal one. As much as I love metal findings, using them feels like cheating sometimes. Will they be necklaces? Earrings? Brooches? 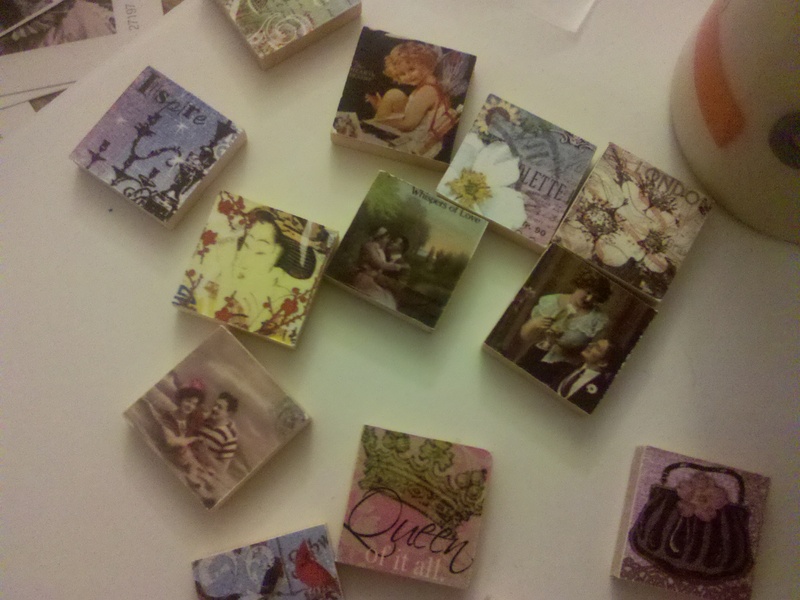 Come to think of it, they were supposed to be frames for my Scrabble tile pendants, right? <scrolls back to the top of the page> Yeah, they were! 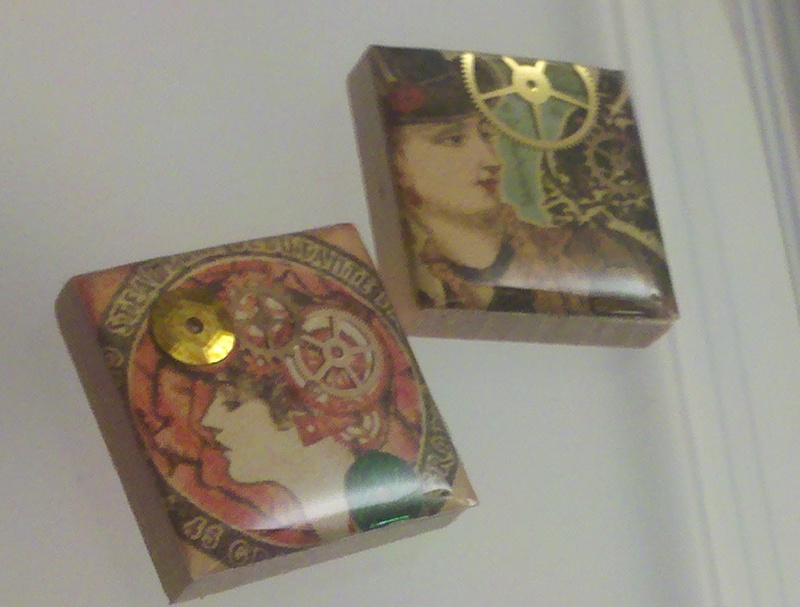 After all that rolling, mixing, and stamping, I only made two frames. Go figure. About a tablespoon and a half of liquid polymer and a quarter teaspoon of powder should be more than enough. A little powder goes a long way -- start smaller and work your way up. Combine the polymer and powder thoroughly before thinning down the mixture with clay softener. Use as much as you need to get it the consistency of thin maple syrup. Experiments with the powders in hopes of creating something really cool (or better yet, something awesome) will continue. They have to. My theory is that if you keep making things, no matter how boring or dull some of them turn out, you will strengthen your creative muscle. The stronger that muscle becomes the more you will get out of your craft, whether it is art, music, or writing. Even the shittiest projects are worth the lesson of what doesn’t work. And still no matter how hard I try I cannot come up with enough text to reach all the way to the bottom of my photos for the entry. Maybe a different layout would help? You can't see it in this image very well, but the liquid polymer mixture did exactly what I wanted to. I repeated the process with the Antique Gold and Pearl White colors. I got a number of different ideas out of my system in this batch. Stamping, cutout exchanges, and a couple of other minor techniques were played with. Posted in Craft and tagged pendants, polymer clay. Bookmark the permalink. You know, I’m still a little awkward at the whole purposeful blogging thing. It might take me a few more posts to become interesting. For now, I’m just going to experiment inside my comfort zone. Bear with me. The Summer does not allow me to work in polymer as often as I like. Luckily it doesn’t last very long in Seattle. Every year I think “maybe I should go ahead and install an a/c unit,” and every year I’m reminded that less than ten days of temperatures over 80 doesn’t justify one. Still, by the time it’s cool enough outside to open windows on those days I am more inclined to go to bed than wait 20-25 minutes for a piece to cure. On a craft store run a couple of months ago my friend Melody said she wanted to try making Scrabble tile pendants like the ones on display in the jewelry supply section. I thought it might be a fun alternative and decided to join her. It probably didn’t hurt that the process didn’t require an oven. We went about collecting tiles, findings, resin, and images to work with. The tiles are simple enough to make, and the materials easy to acquire depending on how attached you are to the whole “Scrabble” brand. A Google search for “scrabble tile pendant” yields a lot of great resources for making and purchasing these pendants. Personally I find a majority of tiles available out there to be a bit juvenile in design. Maybe that’s the target market, maybe that’s the vision of the people who like to make them. At any rate, I found myself not content to pluck tiny segments out of found images and decided to embellish what I had with gems and watch pieces. I really liked how that looked, but the canvas was a bit small for the images I wanted to use. I decided to use larger tiles in different shapes. On the larger tiles I was able to expand my compositions and use collage in a more traditional sense. At one point I experimented with a fabric background, which was interesting. I ended up settling into a design based on silhouettes from in a .jpg I found online. They looked amazing and I was very excited about them until I realized they were probably copyrighted. I’m still waiting to hear back from the original artist on whether or not I can sell them. I can still post an image of my design that uses them, though. Let me know what you think. Personally I think my little necklace experiments aren’t worth arguing over no matter how much I love them. Better safe than sorry, though. 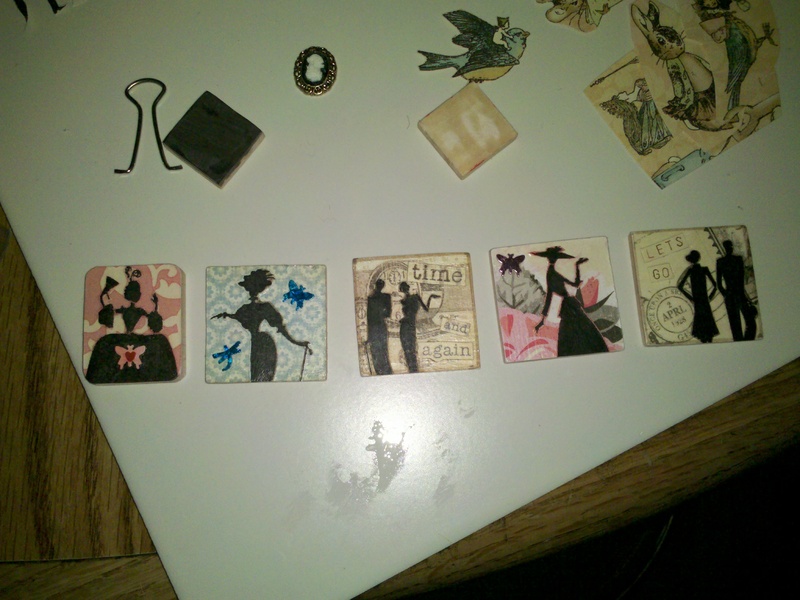 My Silhouette tile designs, featuring shapes influenced by the 1700s, 1870s, 1930s, 1940s, and 1920s, respectively. 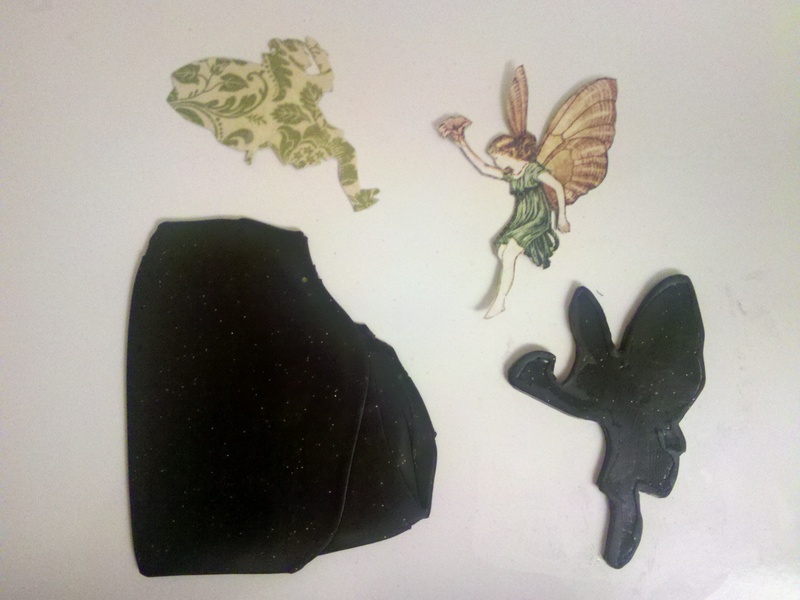 The fairy cutouts and the glittered polymer I used to create their custom tile, pre-bake. Even though the temperature has been pretty high this week, the nights drop into the 50’s after dark. I took the opportunity a couple of nights ago to take the mounted image idea a little further. Instead of using the wood tiles and working within a set shape I figured I’d use the image itself to define the shape of the tile it was mounted on. The polymer works pretty well for that. I used a few fairy cutouts from a Graphic 45 scrapbook paper I liked and created custom shapes for them. I’m not sure how they can be worn (pendant? pin? earrings?) but I’m happy with the effect. I don’t think the picture shows it, but the polymer I used has a glitter inclusion worked into it. It seemed appropriate. As for the little dollop in the center of the pic, that’s kind of an experiment that may or may not go anywhere. It was cute, but not much else. 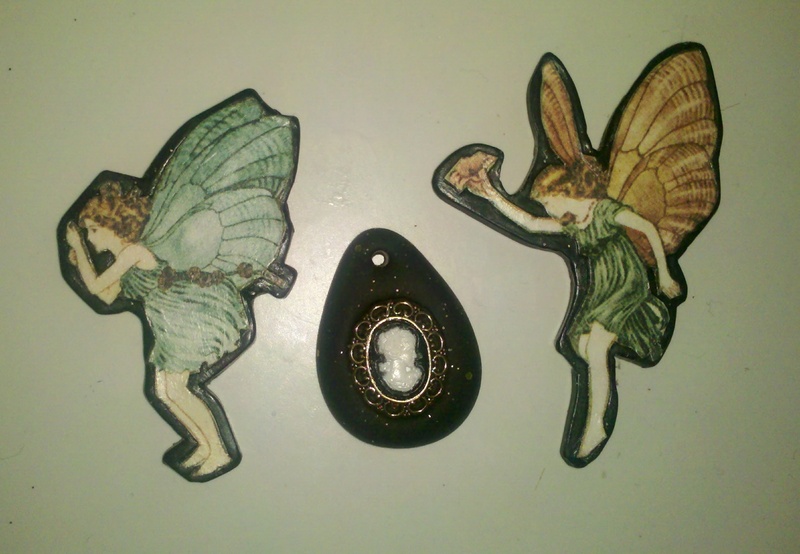 Bake complete, fairies attached to polymer bases. Not sure what the blob in the middle was for, but oh well. So much for purposeful blogging. Maybe next time I’ll actually post more photos of what actually goes on during the process instead of just random images and opinion. Still, it’s a post, and I didn’t have to fire up the oven for it. I’m doing something productive, right? Posted in Craft and tagged paper, pendants, polymer clay. Bookmark the permalink.